Buying an RV is going to open up a world of adventure and opportunities for you that simply wouldn’t have existed with the “traditional” housing arrangement of renting an apartment or buying a home. No longer are you tied to the physical real estate your property sits on top of, and instead you get to slide behind the wheel of your RV and lead as nomadic a lifestyle as you wish – driving up and down the coast, clear across the country, and even visiting other nations knowing that you are always going to have a nice, warm, safe place to stay whenever you decide to park. At the same time, your RV is going to change your lifestyle more than you might expect – especially at first. Sure, you’re obviously going into this purchase recognizing that your RV is going to require some sacrifices be made compared to the way that you have been living previously. The space available is considerably smaller, your house is going to have wheels and no permanent address, and even tackling things like finding electricity and plumbing hookups becomes a lot more challenging than it is with a home or apartment. A lot of people don’t realize that even regular chores are going to change quite a bit with the purchase of an RV. Sure, RV appliances have gotten better and better as time goes – and today they represent major leaps forward in appliance technology that were once thought impossible just a decade or so ago – but you have to look at these appliances differently than you would when purchasing their traditional “big brother” setups for your home or apartment. This is particularly true when you’re talking about RV washer and dryer setups. Investing in a quality washer and dryer set up for your RV is going to dramatically improve your quality of life. Not only will you be able to pop in a load of laundry at almost any time you want to, firing up the dryer even if your clothes are only wet from rain or snow, but you’ll also be able to avoid having to find expensive laundromats and be tied down to locations around those hotspots just to knock out these weekly chores. Unfortunately, purchasing a top-tier RV washer and dryer set up is nowhere near as simple or as straightforward as getting your hands on these appliances for your home or apartment. They have different spatial requirements, utilize different types of technology to get the job done, and usually aren’t represented by the top-tier brands that you are used to shopping for when you’re looking at a traditional setup. Thankfully though, by paying close attention to all of the inside information we share below, you’re going to have no trouble whatsoever finding the right RV washer and dryer for your needs. We’ve put together a couple of quick tips and tricks to focus on while you conduct your research, couple of features and factors you’ll want to zero in on before you pull the trigger on this purchase, and even highlight a couple of the best washer and dryer options for RVs on the market today that you’ll want to look into. Right out of the gate, it’s important to recognize that while there are literally dozens and dozens of different washers and dryers to pick and choose from when you go shopping for these appliances there really are only three major types of washer and dryer design for RVs – and only really two major variations across all three of those setups. This is going to help you narrow down your options significantly, saving you time, money, and energy as you look across all the options available. You’ll need to think about your own RV, how it is set up, the kinds of modifications needed to accommodate your new appliances, and a host of other issues will touch on in just a second. But by and large, you want to focus on finding the right washer and dryer of these three main types before you do anything else. Each of these three types has their pros and cons (something we will dive into in just a second), but they also have two major variations across the board that will impact which RV washer or dryer you should purchase as well. Even though the technology for non-vented systems has improved significantly in just the last 15 years, by and large, you’ll want to get your hands on vented RV setups. They use a lot less power, they dry clothes a lot faster, and they aren’t going to use a lot of water along the way, either. Vented models are going to require some modifications to your RV if appliance “cutouts” don’t already exist. That can be daunting to tackle all on your own and reasonably expensive to have professionals handle for you, which makes non-vented systems attractive. But if safety, efficiency, and long-term expenses are a priority you want to go with a vented set up. Let’s get to the three major types of washer and dryer systems right now. Probably the most common of all the different RV washer and dryer units out there (especially in larger RVs), you’ll be able to wash and dry two separate loads of laundry in most of these solutions without any headache or hassle whatsoever. The most similar of all the RV dryer and washer systems to the traditional units you have in your home or apartment (though always quite a bit smaller and significantly lighter), if you have the available real estate in your RV for these systems and want to be able to knock out larger loads of laundry at the same time this is the kind of technology you’ll want to shop for. Relatively new, the overwhelming majority of new RVs that are being built with washer and dryer capabilities inside of them are taking advantage of these combination units – and it’s easy to see why. Big on saving space, you get a singular appliance that handles double duty – both the washing and the drying of your laundry. Just a little bit smaller than a washer and dryer unit that can be combined or stacked on top of one another, because this is a singular appliance you actually get a little bit of extra room to do larger loads of laundry all at once. 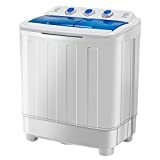 Energy-efficient, water efficient, and automatically switching between washing and drying so that you only have to load and unload laundry just the one time, these are a little bit on the more expensive side of things but definitely provide you with the benefits you are looking for when out on the road. Incredibly compact and easy to use, portable washer and dryer units are ideal for RVers that are going to be doing a bit of “dry camping” without reliable or consistent access to outside electricity. Small, almost always non-vented, and taking advantage of a condensing system, you aren’t going to be able to do quite as much laundry with these portable systems all at once as you would with the other options but you are going to be able to knock out laundry relatively quickly even without having to have access to all kinds of extra resources. One of the best combination units money can buy today, you won’t go wrong getting your hands on the LG unit for your new RV. Utilizing a lot of the same engineering and construction materials found in the traditional washers and dryers LG produces for homes and apartments, this space-saving unit is feature-rich, capable, and incredibly efficient. Some find that it doesn’t dry clothes as quickly as folks would hope, but it has the largest amount of control options, the largest amount of flexibility, and has a reputation for longevity and durability you won’t find anywhere else. Another of the top-tier combination units that can go almost toe to toe with the LG unit we highlighted above, the oversized capacity of this still compact system is what makes this such an attractive purchase for RV owners. You’re looking at a laundry set up in a single unit that can handle loads of laundry upwards of 15 pounds at once, running through a 10 wash cycle/3 dry cycle ratio set up that guarantees your clothes always come out quickly and completely clean. Installation is simple and straightforward and the nearly silent operation of this set up makes it one of the most attractive systems for RV years that are serious about their nomadic adventures. If you don’t want to spend a small fortune on your RV appliances, but still want to be able to take advantage of outsized capabilities from a reliable system you know what isn’t going to fall apart while you are out on the open road, this Panda unit is well worth looking into. Lightweight, easy to install, and super efficient the actual laundry load capabilities and capacity are a little bit limited compared to other options – but it handles washing and drying your clothes very, very quickly. Best of all, it has a simple and straightforward control system and scheme you can flip through effortlessly though you do sacrifice some of the “set it and forget it” capabilities of the more digitized options on the market today. At the end of the day, if you are on the hunt for a top-tier RV washer and dryer set up hopefully you’ll find exactly what you’re looking for with the help of all the inside information we have outlined above. Focus on the real estate availability you have inside of your RV, whether you want to go with a vented or non-vented system, and the kind of budget you are working with – while looking at three options we highlighted above – and you’ll have zero difficulties whatsoever getting your hands on a new RV washer and dryer system that makes life out on the open road a lot more enjoyable!